Shoreline Area News: Can You Fight City Hall? 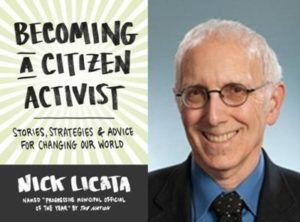 Nick Licata says you can, and told citizens how at his presentation on Tuesday, January 15th at the Lake Forest Park Library. Named “Progressive Municipal Official Of The Year,” by The Nation, Nick served on the Seattle City Council for 18 years, and he knows his stuff. He wrote a book about it all called “Becoming A Citizen Activist.” Nick was an activist before becoming a councilmember. On Tuesday night, he talked about the process involved in changing the law and how to nurture respect at the same time. Showing mutual respect is key to any productive working relationship and knowing the governing rules, and targeting the right legislators for a specific issue or cause is as important, too. Keeping focused and your eye on the ball is needed, and yes, it’s all a lot of hard work! Momentum building, the right timing and creating “a parade” of support are essential in getting that work done, said Nick. If you are in a race against a speeding train, try to slow it down with tactics such as asking for a report, or develop a mitigation strategy. Many tips and successful activist examples bring the concepts all together in his citizen friendly handbook which can be found at local library shelves and Third Place Books. Besides having worked on significant legislation that became a national model, in 2013 he also received the highest votes ever in a Seattle city councilmember contested race. Nick is retired now but says he can’t dampen that activist spirit, and he gave engaged citizens a road map to getting an activist job done.